Over 200 hectares of land that is a part of the wildlife habitat has been granted clearance for the bullet train project. Perhaps we rejoiced too soon that the flamingos in Mumbai had tripled since last year. The Prime Minister, in his four years and 10 months tenure, has added many feathers to his cap. 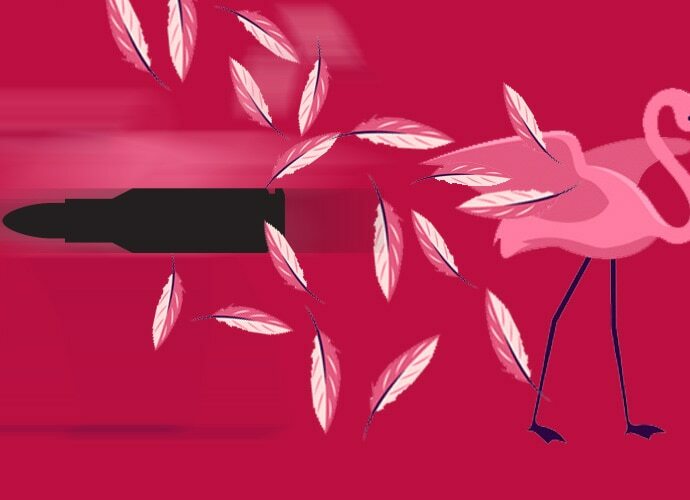 The latest are the feathers of the flamingoes that are soon to depart, owing to the project for one of India’s first ‘bullet trains’ that the Prime Minister inaugurated with his Japanese counterpart Shinzo Abe in Ahmedabad in September 2017. The project involves diverting over three hectares of forestland from the Thane Creek Flamingo Wildlife Sanctuary (TCF) and nearly 100 hectares of land close to the boundary of the forest’s protected area, according to the Minutes of the 52cnd Meeting of the Standing Committee of National Board for Wildlife document. In the meeting — chaired by Union Environment Minister Harsh Vardhan — wildlife clearance has been accorded to the Mumbai-Ahmedabad high-speed train corridor that reportedly encroaches on the Thane Creek Flamingo Wildlife Sanctuary and the Sanjay Gandhi National Park (SGNP) in Mumbai. While the TCF is a flamingo-haven, the SGNP is home to leopards — the present proposal for the bullet train promises to destroy both. 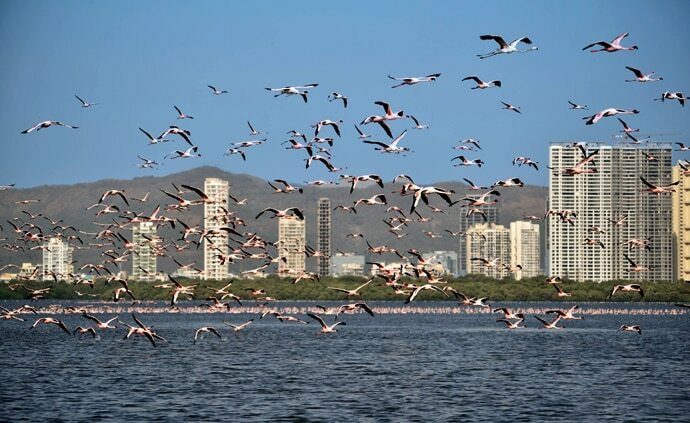 Recently, the Bombay Natural History Society (BNHS) found that the eastern seafront of Mumbai hosted more than 1.2 lakh flamingos in January 2019 — that's up from a mere 45,000 birds that were recorded in October last year. The large presence of flamingos was attributed to the Thane Creek Flamingo Sanctuary, which is now set to lose the race to the high-speed bullet train. Perhaps the wildlife enthusiasts rejoiced too soon. The project proposal reportedly involves diverting 3.2756 hectares of TCF, 97.5189 hectares of land from the outside of the boundary of the protected area, 32.75 hectares of forestland and 77.30 hectares of non-forestland from the Sanjay Gandhi National Park and from 0.6902 hectares of forestland and 4.7567 hectares of non-forest land from the Tungareshwar Wildlife Sanctuary. According to records, the project was accorded wildlife clearance on January 10, 2019. Forest clearance is mandatory for any developmental project — an integral and critical part of forest clearance is wildlife clearance. According to a report in The Hindu, forest clearance process for this particular project was not even a part of the original agenda of the meeting in which it was slated to be discussed. “In some cases, a file can come in through the intervention of the Chair [in this case, Mr Vardhan]. This was one of those projects,” the report quoted a person privy to the process. The bullet train is one of the many ambitious projects that Prime Minister Modi has inaugurated in his tenure. The Rs 1 trillion project, to launch a bullet train between Mumbai and Ahmedabad, is funded by a soft loan by Japan. The bullet train will originate at the Bandra Kurla Complex in Mumbai and terminate at the Sabarmati in Gujarat — a track-length of 508 kilometres. With “development” as his focus, ahead of the elections in 2014, Modi had promised in the BJP manifesto that if voted to power, his government would “frame the environmental laws in a manner that provides no scope for confusion”, so that there can be speedy clearances for proposals, along with a time-bound and transparent decision-making on environment clearances. One cannot fault the Prime Minister for going back on his words — at least, in this respect. In the last five years, the BJP government at the centre has launched an online system for application of green clearances for developmental projects, established standard guidelines for conducting environmental impact studies of projects and set standard conditions for environment clearances to expedite the environment clearance processes. The average processing time for green clearances is now down to 180 days, as opposed to 580 days earlier. The government, as ambitious as the man at its helm, is now aiming at bringing the processing time down to less than 100 days. The expedited clearances have come at a cost — the cost is being borne by the environment and wildlife. The accelerating breakneck speed of “development” brings us to the oft-asked key question: Development for whom — and at what cost?